Tree based on a consensus of molecular phylogenetic analyses (mainly small subunit rRNA genes) published in the following papers: Carreno et al. 1999; Leander 2007, Leander and Keeling 2004; Leander et al. 2003a, 2003b, 2006, Roychoudhury et al. 2007, Rueckert & Leander 2008, Valles & Pereira 2003. Gregarines are a diverse group of apicomplexan parasites that inhabit the intestines, coeloms and reproductive vesicles of marine, freshwater and terrestrial invertebrates. Approximately 250 genera and 1650 species have been described so far (Clopton 2000; Hausmann et al. 2003; Levine 1976, 1977, 1988). Some ancestral characters found in gregarines (e.g. extracellular feeding stages and a monoxenous life-cycle) have given the group a reputation of being “primitive”. Although some lineages of gregarines have retained characters inferred to be ancestral for the group, and perhaps apicomplexans as a whole, most gregarines represent highly derived parasites with novel ultrastructural and behavioural adaptations (Leander 2008). Many marine gregarines, for instance, have become giants among single-celled organisms and have evolved diverse patterns of surface structures (Fig. 1). Comparative gregarine cell morphology placed in a modern phylogenetic context helps clarify the earliest stages of apicomplexan evolution and demonstrates novel ways in which these parasites have solved fundamental biological problems, such as locomotion (nematode-like bending movements, gliding motility and peristalsis), host-dependent nutrition (myzocytosis, nutrition absorption via the surface) and reproduction. The overall biodiversity and phylogenetic relationships of gregarines are very poorly understood and only a small minority of the (predicted) total number of extant gregarine species have been described so far. Less than 1% of known invertebrates have been examined for gregarine infection (Clopton 2000). A compounding issue is that only a tiny number of described gregarine species have been studied at the molecular level, which makes species delimitation (using molecular barcodes) and inferences about broader phylogenetic relationships among gregarines very difficult. 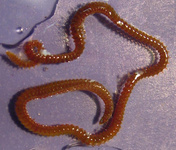 Gregarines inhabit different body spaces within the invertebrate host, such as the intestines, coeloms and reproductive vesicles. Most of the species are known to be host specific: Selenidium spp. infect polychaetes and sipunculids; Lankesteria spp. infect the intestines of ascidians; Monocystis spp. infect the reproductive vesicles of earthworms; neogregarinida infect the cuticle of insects, such as butterflies (Ophryocystis on the Monarch Butterfly); septate gregarines infect the intestines of marine and terrestrial arthropods. Traditionally, three general categories have been used to lump gregarines based on habitat, host range and morphological features of the trophozoites: archigregarines, eugregarines and neogregarines. As the term archigregarines implies, some members of the group (e.g. Selenidium) have retained several ancestral features, such as exclusive presence in marine habitats and the presence of intestinal trophozoites that are similar in overall morphology to the infective sporozoites. They also have 0-50 longitudinal epicytic folds, bundles of microtubules beneath the cell surface and nematode-like bending behaviour (compare Grassé 1953, Schrével 1971a, b). Eugregarines are found in marine, freshwater and terrestrial habitats and possess large trophozoites that are significantly different in morphology and behaviour from the sporozoite stage. The trophozoites have lost the apical complex and instead possess a mucron (or an epimerite). The surface is inscribed by 90-300 epicytic folds, resulting in stiff cells that are capable of gliding motility. Intestinal eugregarines are separated into septate (mostly terrestrial, like Gregarina) and aspetate (mostly marine like the Lecudinidae and Urosporidae) gregarines, depending on whether the trophozoite cell is superficially marked by a transverse septum (Fig. 3). Urosporidians (e.g. Pterospora) are aseptate eugregarines that infect the coelomic spaces of marine polychaetes. Monocystids are aseptate eugregarines that infect the reproductive vesicles of terrestrial annelids and tend to branch closely with neogregarines in phylogenetic trees. Neogregarines are found in terrestrial hosts (e.g. insects); they have reduced trophozoite stages and, like monocystids, tend to infect host tissues other than the intestines (Leander 2008). The transmission of gregarines to new hosts usually takes place by oral ingestion of oocysts in both aquatic and terrestrial environments. 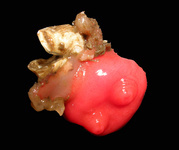 Some gregarine oocysts might be transmitted with host gametes during copulation (e.g. Monocystis, see Fig. 5). In either case, four or more sporozoites (depending on the species) equipped with an apical complex eventually escape from the oocysts (Fig. 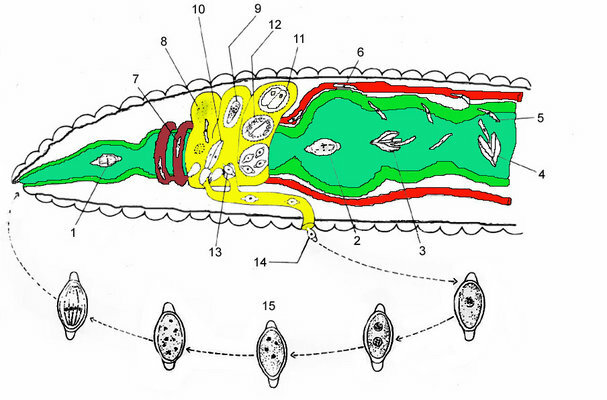 4, steps 8 and 1), find their way to the appropriate body cavity and penetrate the host cells. The sporozoites emerge from a host cell, begin to feed and develop into larger trophozoites (Fig. 4, step 2). Some gregarines have sporozoites and trophozoites that are capable of asexual replication, a process called schizogony (or merogony); most gregarines appear to lack schizogony in their life-cycles (or at least this process has yet to be observed). Two mature trophozoites eventually pair up in a process called syzygy and develop into gamonts (Fig. 4, step 3). The orientation of gamonts during syzygy differs depending on the species (e.g. side-to-side and head-to-tail). A gametocyst wall forms around each pair of gamonts (Fig. 3, step 4), which then begin to divide into hundreds of gametes (Fig. 4, step 5). This process is called gametogeny (Fig. 4, process B). Pairs of gametes fuse and form zygotes (Fig. 4, step 6), each of which becomes surrounded by an oocyst wall (Fig. 4, step 7). Within the oocyst, meiosis occurs to yield four or more spindle-shaped sporozoites (Fig. 4, process A = sporogony) (Kuriyama et al. 2005). Hundreds of oocysts accumulate within each gametocyst, and are usually released via host feces or via host death and decay. Fig. 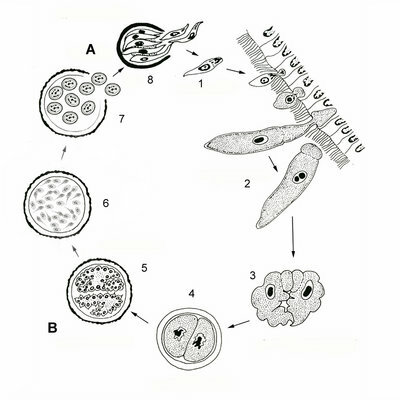 5 illustrates the life cycle of Monocystis agilis. The infection starts with the hermaphroditic earthworm host ingesting an oocyst (1, 2) that releases sporozoites (3, 4) within the intestines (green). The sporozoite is motile and penetrates the intestinal wall (5) and enters the dorsal blood vessel (6). The sporozoite enters the seminal vesicles (yellow) via the (dark red) dorsoventral hearts (7). The sporozoites feed on the host's developing spermatocytes (8) in the wall of the seminal vesicle. 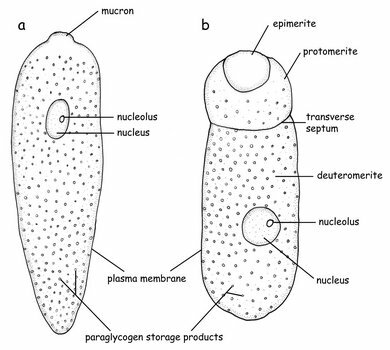 The gregarines then move into the lumen of the vesicle where they mature into trophozoites. Each ball of sperm within the seminal vesicle contains a young trophozoite (9). These trophozoites are covered by remnants of the sperm cells and often superficially take on the appearance of a ciliated eukaryotic cell. After consuming the sperm ball, the now mature trophozoites pair up in syzygy (10). The trophozoites develop into gamonts, and a gametocyst wall forms around each pair (11). Each of the two gamonts undergoes multiple nuclear divisions to produce many nuclei developing into gametes. Two gametes each fuse and form zygotes, which are surrounded by oocyst walls (12). Within this oocyst, the diploid zygote undergoes meiosis and then mitosis to produce eight haploid daughter cells by a process known as sporogony. The gametocysts, or oocysts if they have been released, leave the earthworm through the male genital pore and are liberated into the soil (13, 14). Infection of a new host occurs by oral ingestion of an oocyst (or perhaps through the process of mutual cross fertilization during host sexual reproduction). The life cycle of Ophryocystis elektroscirrha is closely correlated with that of its host the monarch butterfly (Danaus plexippus). Parasite spores are transmitted maternally during oviposition, when infected females scatter spores over eggs and plant (i.e. milkweed) surfaces (McLaughlin & Myers 1970). 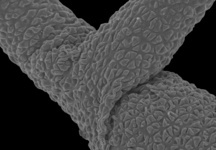 Spores can also be transferred horizontally between adults during mating or other incidental contact. However, the ingestion of the spores by larvae is necessary to start a new infection. Within the larval gut, the spores lyse and release sporozoites that penetrate the intestinal wall, enter the hypoderm and undergo two vegetative, asexual replications. During this time, the monarch larvae pass through five developmental instars (compare Altizer & Oberhauser 1999). After pupation of the host, the parasite completes a sexual reproduction cycle, which ends with the formation of dormant spores on the scales of the developing adult butterfly (McLaughlin & Myers 1970). The density of the spores is highest on the abdomen, but spores can also be found on the wings, head and thorax (Leong et al. 1992). Heavily infected adults have difficulty emerging from the pupal cases and expanding their wings; butterflies with low parasite infections appear to be normal (McLaughlin & Myers 1970, Leong et al. 1992). Ophryocystis elektroscirrha compromises the fitness of monarch butterflies by affecting survival to eclosion, adult size, lifespan, and male reproductive success. These effects are dependent on the parasite load of the butterflies and are mainly restricted to heavily infected individuals (see Altizer & Oberhauser 1999). View Lecudina sp. gliding (from the intestines of the pile worm Nereis) (Leander 2008). These dynamic cell behaviours are thought to facilitate the acquisition of nutrients from the surrounding medium through micropores in the cell surface of the trophozoites. The apicoplast is a remnant, non-photosynthetic homologue to chloroplasts found in many apicomplexan parasites. This organelle was observed first in the 1960s by transmission electron microscopy, but was not identified as a plastid until a 35 kb plastid genome was characterized in 1996 (McFadden et al. 1997, Waller & McFadden 2005; Wilson et al. 1996, Wilson & Williamson 1997). The apicoplast is surrounded by four membranes and has been found in nearly all major groups of apicomplexan parasites (Waller & McFadden 2005). This organelle is inferred to be an ancient feature of the group that was acquired by secondary endosymbiosis with a red algal prey cell. However, apicoplasts appear to be absent altogether in Cryptosporidium (Zhu et al. 2000, Abrahamsen et al. 2004, Xu et al. 2004). 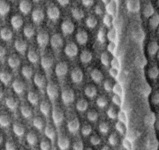 The only evidence for the possible existence of an apicoplast in gregarines is a transmission electron micrograph from Selenidium pendula by Schrével (1971b). Schrével (1971b) found conspicuous vacuoles that were surrounded by four membranes; these structures were unlike any other structure described in gregarines. At that time, apicoplasts had not been discovered. Toso & Omoto (2007) showed by a number of criteria that G. niphandrodes does not have a plastid or plastid genome. Therefore, it remains undetermined whether or not any or all gregarines possess an apicoplast. Most studies on the phylogenetic relationships of gregarines are based on small-subunit ribosomal DNA sequences from a few species (Carreno et al. 1999, Leander 2007, Leander et al. 2003a, b, Leander et al. 2006, Roychoudhury 2007, Rueckert & Leander 2008, Valles & Pereira 2003). Although comparative morphology indicates that gregarines are monophyletic, whether or not other apicomplexan lineages like Cryptosporidium and coccidians sensu stricto are nested within them remains to be rigorously tested with molecular phylogenetic data. Comparative morphology and molecular phylogenetic data strongly suggest that Selenidium (and relatives) forms a paraphyletic group from within which eugregarines and some other highly derived lineages evolved (e.g. Selenidium vivax and relatives) (Leander 2008). Abrahamsen, M., Templeton, T., Enomoto, S., Abrahante, J.,Zhu, G., Lancto, C., Deng, M., Liu, C., Widmer, G., Tzipori, S., Buck, G., Xu, P., Bankier, A., Dear, P., Konfortov, B., Spriggs, H., Iyer, L., Anantharaman, V., Aravind, L., and V. Kapur. 2004. Complete genome sequence of the apicomplexan, Cryptospridium parvum. Science 304: 441-445. Altizer, S., and K. Oberhauser. 1999. Effects of the protozoan parasite, Ophryocystis electroscirrha, on the fitness of monarch butterflies (Danaus plexippus). Journal of Invertebrate Pathology 74: 76-88. Carreno, R. A., Martin, D. S., and J. R. Barta. 1999. Cryptosporidium is more closely related to the gregarines than to coccidia as shown by phylogenetic analysis of apicomplexan parasites inferred using small-subunit ribosomal RNA gene sequences. Parasitology Research 85 (11): 899-904. Clopton, R. E. 2000. Order Eugregarinorida Léger, 1900. Pp. 205-298 in J. J. Lee, G. F. Leedale, and P. Bradbury, eds. The illustrated guide to the Protozoa 2nd Edition. Allen Press Inc., Lawrence. Coulon, P., and M. Jangoux. 1987. Gregarine species (Apicomplexa) parasitic in the burrowing echinoid Echinocardium cordatum: occurrence and host reaction. Diseases of Aquatic Organisms 2: 135–145. Grassé, P.-P. 1953. Classe des grégarinomorphes (Gregarinomorpha n. nov.; Gregarinae Haeckel, 1866; Gregarinidea Lankester, 1885; grégarines des auteurs). Pp. 590-690 in P.-P. Grassé, ed. Traité de Zoologie (Vol. 1). Masson. Hausmann, K., Hülsmann, N., and R. Radek. 2003. Protistology. 3rd completely revised edition. E. Schweizerbart’sche Buchhandlung (Nägele u. Obermiller) Stuttgart, 379pp. Heintzelman, M. B. 2004. Actin and myosin in Gregarina polymorpha. Cell Motility and the Cytoskeleton 58: 83–95. Kuriyama, R. et al. 2005. Dynamic organization of microtubules and microtubule-organizing centers during the sexual phase of a parasitic protozoan, Lecudina tuzetae (Gregarina, Apicomplexa). Cell Motility and the Cytoskeleton 62: 195–209. Landers, S.C., and B. S Leander. 2005. Comparative surface morphology of marine coelomic gregarines (Apicomplexa, Urosporidae): Pterospora floridiensis and Pterospora schizosoma. Journal of Eukaryotic Microbiology 52: 23–30. Leander, B. S. 2006. Ultrastructure of the archigregarine Selenidium vivax (Apicomplexa) - a dynamic parasite of sipunculid worms (Host: Phascolosoma agassizii). Marine Biology Research 2: 178–190. Leander, B. S. 2007. Molecular phylogeny and ultrastructure of Selenidium serpulae (Apicomplexa, Archigregarinia) from the calcareous tubeworm Serpula vermicularis (Annelida, Polychaeta, Sabellida). Zoologica Scripta 36 (2): 213-227. Leander, B. S. 2008. Marine gregarines: evolutionary prelude to the apicomplexan radiation? Trends in Parasitology 24(2): 60-67. Leander, B. S., Clopton, R. E., and P. J. Keeling. 2003a. Phylogeny of gregarines (Apicomplexa) as inferred from small-subunit rDNA and beta-tubulin. International Journal of Systematic and Evolutionary Microbiology 53 (Pt 1): 345-354. Leander, B. S., Harper, J. T., and P. J. Keeling. 2003b. Molecular phylogeny and surface morphology of marine aseptate gregarines (Apicomplexa): Selenidium spp. and Lecudina spp. Journal of Parasitology 89 (6): 1191-1205. Leander, B. S., Lloyd, S. A. J., Marshall, W., and S. C. Landers. 2006. Phylogeny of Marine Gregarines (Apicomplexa) -Pterospora, Lithocystis and Lankesteria - and the Origin(s) of Coelomic Parasitism. Protist 157 (1): 45-60. Leong, K. L. H., Kaya, H. K., Yoshimura, M. A., and D. F. Frey. 1992. The occurrence and effect of a protozoan parasite Ophryocystis elektroscirrha (neogregarinida: Ohryocystidae) on overwintering monarch butterflies Danaus plexippus (Lepidoptera: Danaidae) from two California winter sites. Ecological Entomology 17(4): 338-342. Levine, N. D. 1976. Revision and checklist of the species of the aseptate gregarine genus Lecudina. Transactions of the American Microscopical Society 95(4): 695-702. Levine, N. D. 1977. Revision and checklist of the species (other than Lecudina) of the aseptate gregarine family Lecudinidae. Journal of Protozoology 24: 41–52. Levine, N. D. 1988. Progress in taxonomy of the apicomplexan Protozoa. Journal of Protozoology 35(4): 518-520. McFadden, G. I., Waller, R. F.,Reith, M., Munholland, J., and N. Lang-Unnasch. 1997. Plastids in apicomplexan parasites. Plant Systematics and Evolution (Supplementa) 11: 261-287. McLaughlin, R. E., and J. Myers. 1970. Ophryocystis elektroscirrha sp. n. a neogregarine pathogen of the monarch butterfly Danaus plexippus (L.) and the Florida quenn butterfly Danaus gilippus berenice Cramer. Journal of Protozoology 17: 300-305. Olsen, O.W. 1974. Animal parasites: Their life cycles and ecology. Dover Publications, Inc., New York. Omoto, C.K., Toso, M., Tang, K and. Sibley, L.D., 2004. Expressed Sequence Tag (EST) analysis of Gregarine gametocyst development. Int. J. Parasit. 34:1265-1271. Roychoudhury, S., Isawa, H., Hoshino, K., Sasaki, T., Saito, N., Sawabe, K., and Kobayashi, M. 2007. Comparison of the morphology of oocysts and the phylogenetic analysis of four Ascogregarina species (Eugregarinidae: Lecudinidae) as inferred from small subunit ribosomal DNA sequences. Parasitology International 56 (2): 113-118. Rueckert, S., and B. S. Leander. 2008. Morphology and phylogenetic position of two novel marine gregarines (Apicomplexa, Eugregarinorida) from the intestines of North-eastern Pacific ascidians. Zoologica Scripta 37(6):637-645. Schrével, J. 1971a. Observations biologique et ultrastructurales sur les Selenidiidae et leurs conséquences sur la systématique des grégarinomorphes. Journal of Protozoology. 18: 448–470. Schrével, J. 1971b. Contribution a l’e´tude des Selenidiidae parasites d’annélides polychètes. II. Ultrastructure de quelques trophozoites. Protistologica 7: 101–130. Stebbings, H. et al. (1974) Microtubules and movement in the archigregarine, Selenidium fallax. Cell Tissue Research 148: 331–345. Toso, M. A., and C. K. Omoto. 2007. Gregarina niphandrodes may lack both a plastid genome and organelle. Journal of Eukaryotic Microbiology 54(1): 66.72. Valles, S. M., and R. M. Pereira. 2003. Use of ribosomal DNA sequence data to characterize and detect a neogregarine pathogen of Solenopsis invicta (Hymenoptera: Formicidae). Journal of Invertebrate Pathology 84 (2): 114-118. Vávra, J., and E. B. Small. 1969. Scanning electron microscopy of gregarines (Protozoa, Sporozoa) and its contribution to the theory of gregarine movement. Journal of Protozoology 16: 745–757. Vivier, E. 1968. L’organization ultrastructurale corticale de la gregarine Lecudina pellucida: ses rapports avec l’alimentation et la locomotion. Journal of Protozoology 15: 230–246. Vivier, E. and I. Desportes. 1990. Apicomplexa. In: Margulis, L., J.O. Corliss, M. Melkonian, and D.J. Chapman, eds. 1990. Handbook of the Protoctista; the structure, cultivation, habits and life histories of the eukaryotic microorganisms and their descendants exclusive of animals, plants and fungi. Jones and Bartlett Publishers. Boston. pp. 549-573. Waller, R. F., and G. I. McFadden. 2005. The apicoplast: A review of the derived plastid of apicomplexan parasites. Current Issues in Molecular Biology 7: 57-80. Wilson, R. J. M., and D. H. Williamson. 1997. Extrachromosomal DNA in the Apicomplexa. Microbiology and Molecular Biology Reviews 61: 1-16. Wilson, R. J. M., Denny, P. W., Preiser, P. R., Rangachari, K., Roberts, K., Roy, A., Whyte, A., Strath, M., Moore, D. J., Moore, P. W., and Williamson, D. H. 1996. Complete gene mapof the plastid-like DNA of the malaria parasite Plasmodium falciparum. Journal of Molecular Biology 261: 155-172. Xu, P., Widmer, G., Wang, Y., Ozaki, L., Alves, J., Serrano, M., Puiu, D., Manque, P., Akiyoshi, D., Mackey, A., Pearson, W., Dear, P., Bankier, A., Peterson, A., Abrahamsen, M., Kapur, V., Tzipori, S., and G. Buck. 2004. The genome of Cryptosporidium hominis. Nature 431: 1107-1112. Zhu, G., Marchewka, M., and J. Keithly. 2000. Cryptosporidium parvum appears to lack a plastid genome. Microbiology 146: 315-321.